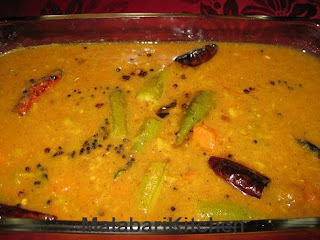 Sambar is a vegetable stew made with dal and vegetables in a spicy tamarind base. It is usually poured alongside rice, idly, vada. In Malabar region fried coconut is a main ingredient in Sambar. Ladies finger, carrot, drumstick and beans cut to pieces lengthwise 1 1/2inch. Ash gourd, tomato, oinion, potato cut to small slice. =►Heat 1/2tsp of oil in a frying pan, add ladies finger and sauté it 2-3min on medium flame and keep it aside. =►Heat 1tsp of oil, add fenugreek and allow it to splutter. =►Add Urad dal, red chilly, coriander, sambar powder & grated coconut in to it and fry it. =►Sauté it till the coconut turns golden brown. =►Once it gets brown color, remove it from the pan and let it cool for 10 min. =►Grind the above mixture to thin paste and keep it aside. =►Once it is cooked add fried ladiesfinger and drumstick into it and cook it for 2-4min. =►Add tamarind juice into it and allow it to boil for 4-6min on medium flame. =►Add grinded coconut paste after the tamarind juice boils and cook it for 2-3min. =►Season it with mustard, dry red chilly and curry leaves. =►Add finely chopped cilantro for garnishing. wow ... First of I miss my Mom's Food ..
Lisha, DEfntly i vl try Sambar this weekend ..
anyway good works .. best wishes .. keep doing ..